Stored with the Bosbury wills, you often find a Bond which the executor, administrator or creditor had to enter into with the bishop before the probate court would grant probate. The purpose of the bond was to bind the bondsperson to perform a set of defined actions at or before certain dates, and in this way to ensure the testator’s will was fully executed or that the intestate’s estate was properly administered. Such a bond protected the interests of creditors, legatees and the next of kin of the deceased. They were also a means of indemnifying the bishop and his officials from the consequences of any default or maladministration of the deceased’s estate on the part of the executors or administrators. The Condition would usuually state that the bondsperson must exhibit in the court at or before certain dates first an inventory of the deceased’s goods, and then some time later, upon the completion of their duties, a financial account. When both documents had been officially passed by the court and entered into the registry, the responsibilities of the bondsperson were completed. 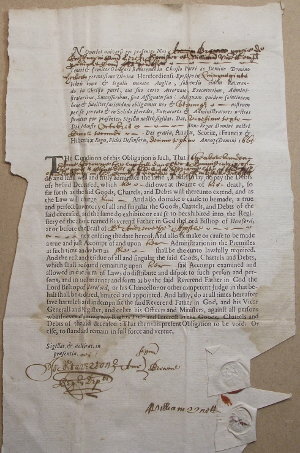 The Bond is a printed sheet with spaces for handwritten insertions. The first paragraph in Latin is the bond itself. The names of the parties are given, the penal sum if the bond is not fulfilled and the date of signing. The second paragraph in English gives the Condition which applies. The last part says that if the bond person does as promised, the bond will become null and void. If not, then it will remain in force and that person becomes liable to pay the penal sum. The Condition of this Obligation is such, That if ̲ ̲ ̲ ̲ ̲ ̲ ̲ ̲ ̲ ̲ ̲ ̲ ̲ ̲ ̲ ̲ ̲ ̲ do and shall well and truly administer the same; that is to say do pay the Debts of the said Deceased, which ̲ ̲ ̲ ̲ ̲ ̲ did owe at the time of ̲ ̲ ̲ ̲ ̲ ̲ death, so far forth as the said Goods, Chattels, and Debts will thereunto extend, and as the Law will charge ̲ ̲ ̲ ̲ ̲ ̲ And also do make or cause to be made a true and perfect Inventory of all and singular the Goods, Chattels and Debts of the said deceased, and the same do exhibite or cause to be exhibited into the Registry of the above named Reverend Father in God the Lord Bishop of Hereford at or before the Feast of ̲ ̲ ̲ ̲ ̲ ̲ ̲ ̲ ̲ ̲ ̲ ̲ next ensuing the date hereof. And also do make or cause to be made a true and just Accompt of and upon ̲ ̲ ̲ ̲ ̲ ̲ Administration in the Premises, at such time and when as ̲ ̲ ̲ ̲ ̲ ̲ shall be thereunto lawfully required. And the rest and residue of all and singular the said Goods, Chattels and Debts which shall be found remaining upon ̲ ̲ ̲ ̲ ̲ ̲ said Accompt examined and allowed in due form of law, do distribute and dispose to such person and persons. and in such manner and form as by the said Reverend Father in God the Lord Bishop of Hereford or his Chancellor or other competent Judge in that behalf shall be ordered, limited and appointed. And lastly do at all times hereafter save harmless and indemnify the said Reverend Father in God, and his Vicar Generall and Register, and other his Officers and Ministers, against all persons whatsoever, claiming any Right, Title and Interest, in the Goods, Chattels and Debts of the said deceased: That then this present Obligation to be void. Or else to stand and remain in full force and vertue. Sigillat. et deliberat in praesentia. NB A general point is that the debts of the deceased were always settled first, before payment of legacies or distribution to the next of kin, but they could only be settled in so far as the total value of the deceased’s estate allowed.